'Kong: Skull Island' Debuts A Gigantic Comic-Con Trailer! That was Kong: Skull Island director talking to EW about the massive scope of the film, or more accurately the massive size of King Kong himself. Honestly, that was made abundantly clear in the teasers released prior to the release of the brand new trailer, which hit at Comic-Con just minutes ago. The film is set in the 1970s, a nice a twist, and stars Tom Hiddleston as an SAS tracker and Brie Larson as a war photographer who are both part of a group sent to the island to find the gigantic ape. Samuel L. Jackson is around stirring up all kinds of anti-ape sentiments, has he not seen Dawn of the Planet of the Apes? That guy always gets killed. And why would you want to piss off Kong when he measures at over 100-feet in height? That just seems like an idiotic move. At that size Kong should have an easier time facing off against Godzilla, though. 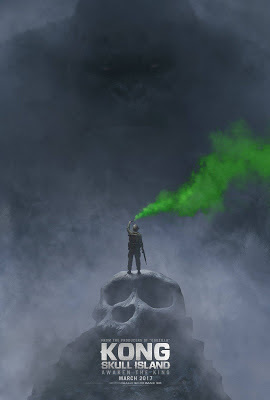 Also starring John Goodman, Corey Hawkins, Jason Mitchell, Thomas Mann, Toby Kebbell, and John C. Reilly, Kong: Skull Island opens March 10th 2017.